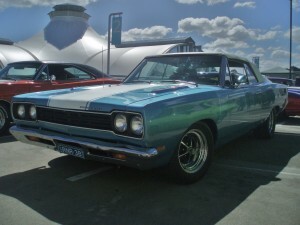 The B-body 1968 Plymouth Road Runner is from Plymouth’s first generation Road Runner line which was based on the Belvedere and ran from 1967 to 1970. Body Style: The earliest ’68 Road Runners were only offered as a 2-door B-pillared coupe, meaning there was a pillar positioned between the front and rear windows; but later in 1968, Plymouth started to offer a pillarless hardtop model. Engine: The 1968 Road Runner was offered with a 383 cubic inch displacement (CID) V-8 that had been enhanced with the addition of high-performance 440 Magnum/Super Commando cylinder heads; the one engine option offered on the 1968 Road Runner was the 426 Hemi. 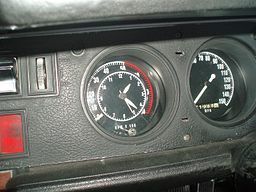 Transmission: The standard package’s transmission for the ’68 Road Runner was a manual four-speed, with different gear ratios for the 383 and the 426 Hemi, but the three-speed TorqueFlite A727 automatic was available as an option; note that the TorqueFlight was a column-shift unit to accommodate the bench seat. The 3475-pound total body weight 1968 Road Runner was a muscle car, designed for performance and fun over comfort, with rubber floor mats instead of carpeting and a bench seat. The Road Runner was built for speed in a time when fuel efficiency wasn’t a major consideration for car buyers and it only got about 10.2 miles per gallon; but what it lacked in fuel efficiency, it made up for in power with a top speed of about 137 miles per hour. The stock 383 CID/335 hp Road Runner could go from 0-60 miles per hour in 7.1 seconds. from the 383 – 335 hp and 426 Hemi / 425 hp could go from 0-60 in a mere 5.3 seconds. Plymouth purchased licensing rights for the cartoon’s road runner likeness, name, and beep-beep sound to name and promote this sleek, mid-sized performance car. Stop by the classified ads section to browse through listings of classic cars for sale, or to place your own free ad.